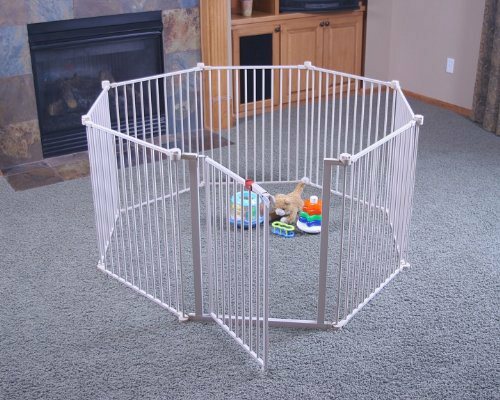 Regalo 4-in-1 Metal Play Yard encloses a large 19 square feet area or 192" wide gate. Numerous possibilities! Can be configured into a variety of shapes and sizes to fit your needs. Not only can it be used as a Play Yard, but also converts to a fire place guard, gate enclosure for extra wide openings and stairway barrier. This all steel Play Yard comes equipped with a walk through door and safety lock. Folds and Go technology allows you to easily move this product from indoors to outdoors. Includes all hardware!